In Pennsylvania, we can start counting our “days” of learning toward our 180-day-per-year requirement effective July 1. Doing that, we’re usually “done” for the year by early to mid-April, and then nothing we do for the rest of April, May and June has to be documented in any way. 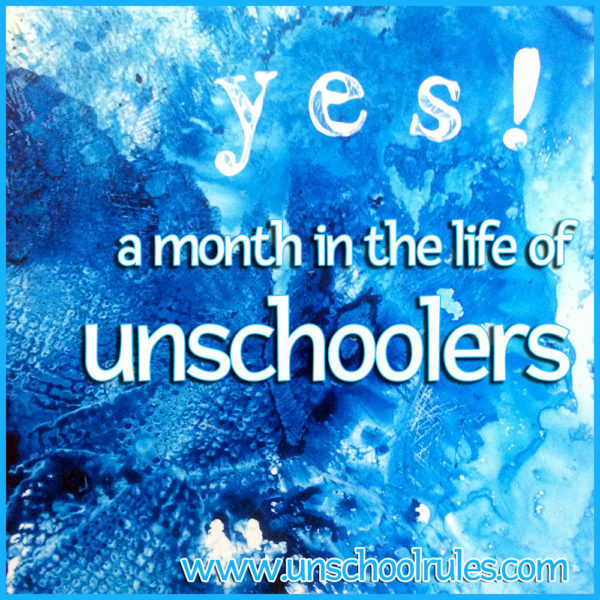 Of course, I blog about those months here, because in unschooling, our learning and living doesn’t really change just because it’s not official, but somehow, things always do seem to kick into high gear around July. If you’re new to seeing our days recapped in this format, check out our archive of previous wrapups here for some more info on why we take this approach and some other highlights of our adventures. 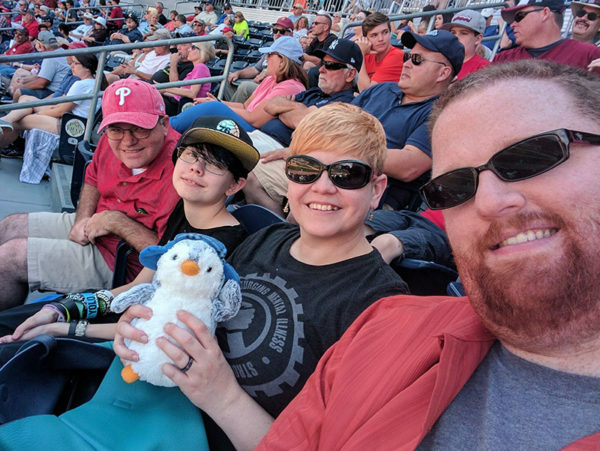 Chris, Sarah, Plaid Pengin, Dan and I having a fun day at the Lehigh Valley IronPigs vs. Scranton/Wilkes-Barre RailRiders AAA baseball game! One of the coolest things was the afternoon that Sarah and my mom, her Mommom, sat down and watched a DVD of Orangemite’s performance of The Merry Wives of Windsor. We also had a nice night out (despite a freak rainstorm) seeing Orangemite’s team perform Sophocles’ Antigone. Then, at the end of the month, one of the other theater groups Sarah is involved with, DreamWrights, staged The Taming of the Shrew, featuring several of Sarah’s friends, and we got to go see that as well. Next up, Sarah is preparing to audition with her friend Nash for Orangemite’s next production, Antony and Cleopatra. She’s also planning to audition, along with Dan, for Frankenstein at The Belmont, another local theater. And, as summer winds down (did I really just write that?!) we’re planning to have a Shakespeare Film Festival at home, watching some various movies and recorded stage adaptations. 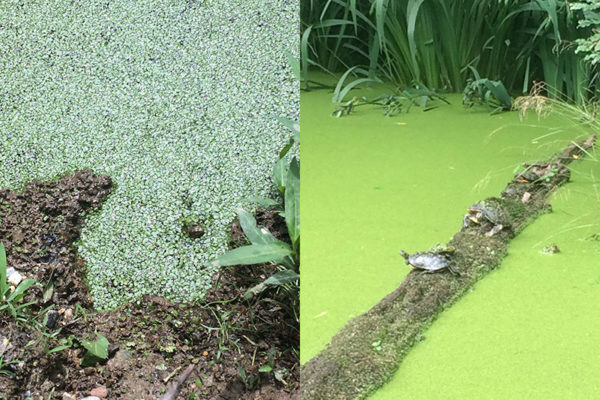 During Reptile Week at one of our county parks, we got to visit the pond and see a bunch of great frogs (left) and turtles (right). I mentioned this last month, too. Our library system has this really cool program called Get Outdoors York that is an add-on to the summer reading club. You get a booklet with 30 hikes listed, and at the end of each hike you find a plate with a rubbing on it. (Very similar to letterboxing or geocaching.) We’re up to, I think, 15 of the 30, and hope to get at least a couple more before the program ends Aug. 20! July’s hikes were neat, and included one at a former canal lock, which gave us a chance to talk about how canals used to work and how they work now. (Fun note: One of Sarah’s grandmas traveled the Panama Canal in a cruise ship!) 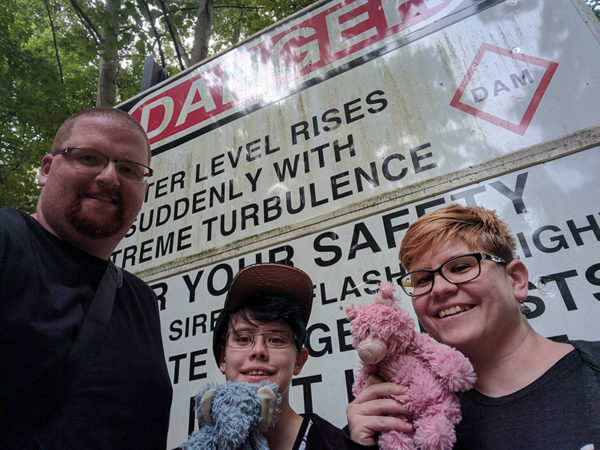 There’s also a cool dam near there with huge scary danger signs, and we got to see what we later realized was a BIG OL’ MILLIPEDE. That’s a dam scary sign. (See what I did there?) This was taken with Pascal the elephant and Sammiches the pig as well as Dan, Sarah and I during a hike at the Lock 12 Recreation Area near Holtwood Dam outside Airville, PA.
Dan, Sarah and I also did a cool hike at one of our biggest county parks during Reptile Week, which included a chance to view a bunch of frogs and turtles in their pond as well as a live reptile show by Forgotten Friend Reptile Sanctuary. 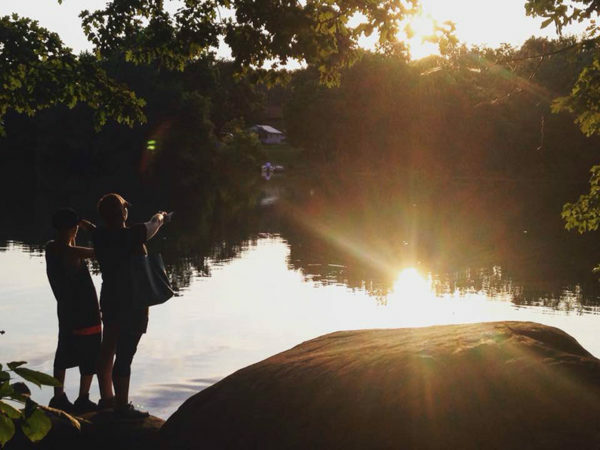 And Chris, Sarah and I did a nice sunset hike at my favorite state park, Gifford Pinchot. In addition, we did get to do some reading. Actually, this month, we did a LOT of reading. Cross Kill by James Patterson – Sarah had been reading this novella to me, and we finished it in July. It left us with a huge cliffhanger that won’t be resolved until Patterson’s next novel releases in late fall, argh. As we read this, we ended up going down some HUGE rabbit trails. One night, we talked for a couple hours about the bones of the hand, traumatic brain injury, scoliosis, brain surgery, comas, foreshadowing and context clues, all based on a two-page chapter. Another night, we had a serious conversation about whether crime excuses crime – in other words, if you think someone is threatening to hurt you or has already hurt someone else, do you have the “right” to hurt them? That got really complicated real fast, but it was cool to talk about together. The Trial by James Patterson – At the end of Cross Kill was a preview for this novella. Sarah read the preview and decided she wanted to read more, so we checked this out of the library and are already several chapters in. Little House in the Big Woods by Laura Ingalls Wilder – I think I mentioned last month that Sarah caught the first episode of the Little House on the Prairie TV show at a friend’s house and it led to a bunch of conversations. Well, shortly after that, we went to a bookstore and she ended up wanting to buy the books to see how they compare. We’re actually reading those together as well – we REALLY love reading aloud as a family and it gives us so many rabbit-trail chances. Twisted History by Howard Watson – We had picked this up on a clearance rack a year or so ago, and Sarah dug it out thanks to her recent interest in Shakespeare – because it included the story of Julius Caesar, which she is digging into as sort of the prequel to Shakespeare’s Antony and Cleopatra, which she’s auditioning for this month! Romeo and Juliet – This has long been one of Sarah’s favorite works, and this month, she, Dan and I took turns re-enacting the famous balcony scene. Helpfully, we have sort of a balcony overlooking our two-story living room, so I got to sit up there and be Juliet. Pirates: From Blackbeard to Walking the Plank by David Pickering – This was another clearance-rack find that makes a great browsing book – one you can pick up and read little bits of here and there. We’re big on browsing books in our family! Sarah read me a bunch of pirate facts one evening. Old Man Logan: The Last Ronin – Sarah’s most recently finished comic-book selection. She and Chris make almost-weekly comic store trips and he and the library keep her well-supplied! Also this month, Dan and I got bikes (Sarah already had one), and we started going for bike rides together, including a nice longish one on the local Rail Trail. 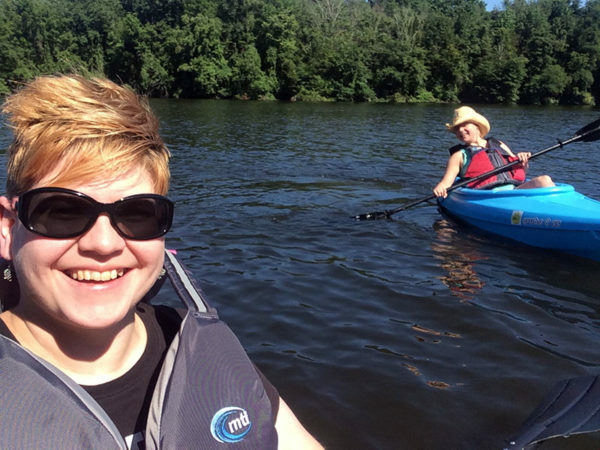 Thanks to my friend Kara (right), who kindly let me try her kayak, I ALSO have become a kayaker. Here we are on the first voyage of my kayak, Orange Crush, which looks exactly like Kara’s blue kayak, except… it’s orange. Then, at the end of the month, a friend from 4-H happened to offer free tickets to our local Atlantic League team, the York Revolution. We arrived in time for the third inning, sat in the front row (which I’d never done before), and went on to watch the Revs beat the Bridgeport Bluefish, 9-1. One of the Revs players gave Sarah a foul ball, and at the end, he and another player signed it! That game was a great reminder to me not to book our lives too full. It worked because we didn’t have many solid plans for the evening and were able to say, “Hey, we can absolutely go do that!” So many times, I’m guilty of having a mile-long to-do list and no margin for fun spur-of-the-moment stuff. I keep working on that, though, because I see what cool things happen when that’s not the case. 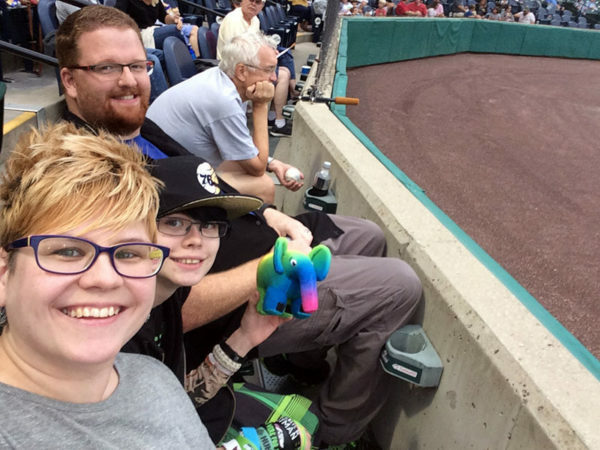 Dan, Sarah and I got free front-row seats to a local Atlantic League baseball game, thanks to a friend from 4-H. Philip the phpDiversity elephant also enjoyed the game. We had a bit more movie-watching this month, plus we picked up some fun from YouTube as well. Kiki’s Delivery Service – This Miyazaki film is one of our favorites, and we went to see it on the big screen as part of Studio Ghibli Fest. If you haven’t seen any of Miyazaki’s beautiful anime films (or, hey, if you have and want to REALLY enjoy the artistry), you should check out that Ghibli Fest website. Theaters all over the country are showing his movies through October. We’re hoping to catch more! Sherlock Series 4 – This was where Sarah had left off with Sherlock on Netflix, and she picked him back up in July and watched the fourth season. The Mummy – Chris took Sarah to see this because I was afraid it would be too scary. Yes, I am that easily scared. It turns out it was also funny and she really liked it, but I’m still kinda glad I didn’t go. Seeing Tom Cruise always makes Sarah happy. Pirates of the Caribbean: Dead Men Tell No Tales – This one, we went to see because I really wanted to. It was awesome. I love Johnny Depp. Also, I REALLY like the music in the Pirates movies. City Slickers – I got in my head that Sarah would absolutely love this movie, and I don’t actually know why. She did love it, but I’m not sure why I decided it was a must-see. But it was, and we did, and we were all happy. Also, now we want a pet cow. And I’m definitely not ashamed to say that I’m gunning for City Slickers 2 to be on next month’s movie list. Clearwater Marine Aquarium’s YouTube channel – Sarah has been into Clearwater since seeing the movie Dolphin Tale a few years ago, about Clearwater’s rescue of Winter the dolphin. I get their emails and occasionally they’ll promote a cool video. This month, we watched a few from their YouTube channel, including one about a very nice pelican named Ricky who got a new habitat. It was kind of a ridiculous idea when we had about 100 pending requests, but then, in the last week of June, it got shared on a bird-lovers’ group on Facebook with 70,000 members, and got picked up by a bunch of freebie sites. By the end of June, we had reached 21,000 requests. We also raised more than $1,900 in donations, which allowed us to order 30 dozen pengins and accompanying shipping boxes. They live in my basement now, until we get the money to ship them. Thankfully, we’ve already sent almost 3 dozen (of, again, 30 dozen total) and are trying to get more out at the rate of a couple dozen a week. If you think this is a hilarious/worthwhile/mildly insane project, I definitely would love to have you follow the Pengins for Everyone Facebook page. We share ridiculous photos and videos of our crew hard at work managing 30 dozen stuffed penguins. Did I say 30 dozen stuffed penguins yet? 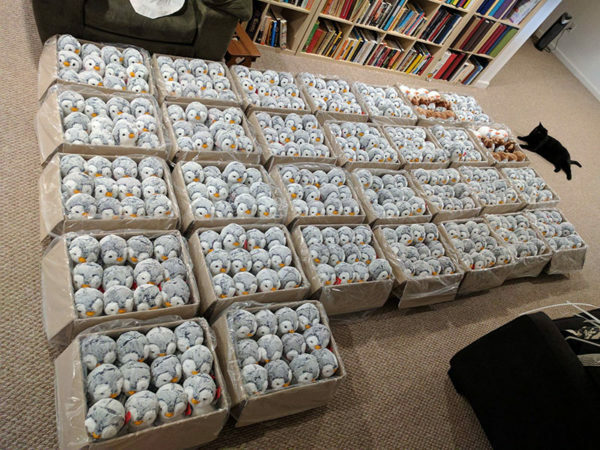 That’s 30 dozen stuffed penguins, getting ready to be given away as part of the Pengins for Everyone project. 30. Dozen. Stuffed. Penguins. Anyway, in July, Sarah set that up and started – and later beat – Uncharted 4. The Uncharted games are cool – they follow an explorer named Nathan Drake and they work in a surprising amount of cool facts. To wit: I’m watching Sarah play one evening, and a younger Nathan (early teens) and his older brother are exploring the house of an older couple who had explored the world and had a bunch of neat artifacts. Nathan puts on a helmet with horns and ends up telling his brother that it is in fact not a Viking helmet, because “You know Viking helmets don’t have horns… it’s Persian!” This is why learning from video games is so cool to us – because that led us to looking up Viking helmets, and sure enough… nope, they didn’t have horns; that’s a legend spread by how they’re costumed in Wagner’s Ring Cycle. Which then led us to talking about opera. That’s unschooling when it’s the coolest. Dave and Buster’s: After our AAA Phillies/Yankees game, we headed to Dave & Buster’s in Plymouth Meeting, PA, and had a great time eating and playing. D&B is one of our favorite spots, and we’re excited that they’re building one only a half-hour away in the next year or so! Speaking of food: Also as part of our staycation, we drove about 45 minutes away to hit up a Bonefish Grill, mostly as a treat for my mom, who loves seafood, and Chris, who is a vegetarian. It was great! We also enjoyed not one but two Universal Yums boxes this month, Mexico (which was spicy and not as much to our liking as some) and South Korea (which, surprisingly, was a HUGE win full of stuff we almost all liked! As always, those boxes ended up being a great chance to talk about some fun facts about the snacks’ countries of origin. Since Dan’s brother is adopted from South Korea, that made that box especially cool. 4-H: August is 4-H Fair (Roundup), so July is always full of lots of stuff to get ready for that. Sarah’s dog project group, the Clover Canines, was meeting just about once a week to practice, and she had a bunch of work to do to finish her alpaca genetics project (which, August spoiler alert, got done MORE THAN A WEEK BEFORE ROUNDUP, which for us is like a Christmas miracle). Our next update will showcase the finished work there. Art flea market: Sarah and my mom and I all love to paint acrylic ink abstracts. In the past month or so, I’ve really ramped up my art as a side business, both selling it through my online gallery and starting to attend local events. In July I took part in an art flea market, which did not net me a ton of money but which was a great experience (and at which my sales at least partially offset the money I would have spent anyway as an attendee buying local art!) I did another art market early in August, and after that comes time to enter our art in the county fair. The new house: As we enter Month 3 at our new house, we did a bunch of landscaping work – clearing out an area behind our shed and fence that had been overrun with weeds, and putting down weed guard and some river rock. I say “some” river rock because our delivery of ALL the river rock did not show up, so we’re filling it in a few bags at a time as our Honda Civic can handle it. Thankfully (another August spoiler alert) we just bought an SUV, so we should be able to finish it up more easily! Sarah also got to send a postcard to her Taiwanese pen pal, Christina, giving her our new address so that the two of them can stay in touch. 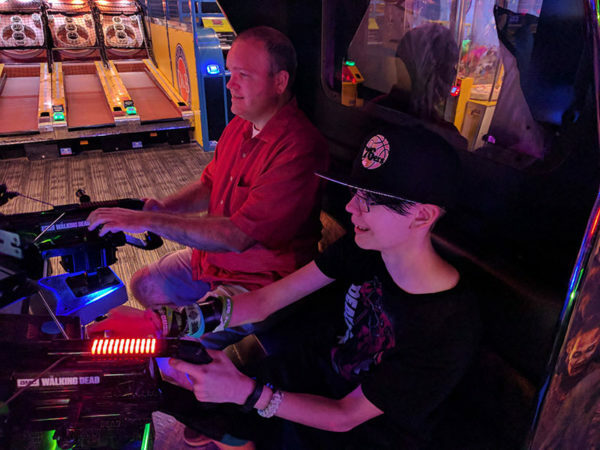 Chris and Sarah had a thrilling time killing zombies in the Walking Dead game at Dave and Buster’s. This entry is about blog, books, monthly wrapup, movies, unschooling. The previous post was Filling in the gaps with online math that adapts. The next post is The unschooled version of an 12th-grade-ish curriculum plan for 2017-18. The James Patterson novellas have been a great idea and there seems to be a slightly renewed spark toward reading more. She is REALLY KEEN on Stephen King books right now, although I think part of it is just an interest in “collecting” the books (who do we know who would do that? ), because she admits that actually reading some of the longer ones would be quite daunting. But she was showing an interest in having paperbacks of It, The Stand, The Shining and Salem’s Lot. … I am tryign to steer her toward the short-story collections (Skeleton Crew, Night Shift), so that hopefully she can get some “finished” reading accomplishments under her belt and build some momentum. I’ve noticed that too – and I just bought two more Stephen King short story collections earlier this week that maybe she can get into as well! Hey… everything is new with us this week as we’ve moved from Spain to South Dakota (culture shock, anyone?) Anyway, I was wondering what kind of “system” you use for keeping track of everything y’all do in a month? I would love a snapshot of a notebook or technology program or something that helps you keep up. We will now have to start keeping track of things here. Whoa, that’s a big difference! I was actually thinking of doing a post in another week or so with my planner system (which isn’t just for unschooling-type stuff, but definitely includes that)… I’m guessing you’d be interested? The short version I use a paper planner from Orange Circle Studio called the Flexi-Planner, and I use one particular set of pages each month to keep very short notes that go into these posts! I also use it to track my bills, my to-do lists, good things that happen, my “year in pixels” (color-coded overview of how good each day was), the whole works. I pretty much live for it! I can definitely get together some photos and share more about how we make it work for us, too!